Steller’s Jays on the Move /Hawks Aloft Inc.
Steller’s Jays are usually birds of evergreen forests in the mountainous West, including New Mexico. A common species, they can be found in wilderness, but also are regular attendees of campgrounds, parks, and backyards, where they are quick to spy bird feeders as well as unattended picnic items. 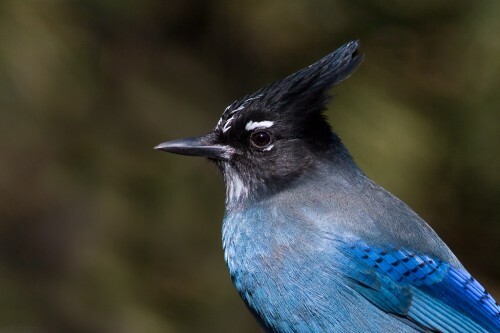 A generalist omnivore, like other corvids, the diet of a Steller’s Jay includes insects, seeds, berries, nuts, small animals, eggs, and nestlings. They also are known to consume garbage, unguarded picnic items, and feeder fare such as peanuts, sunflower seeds, and suet. 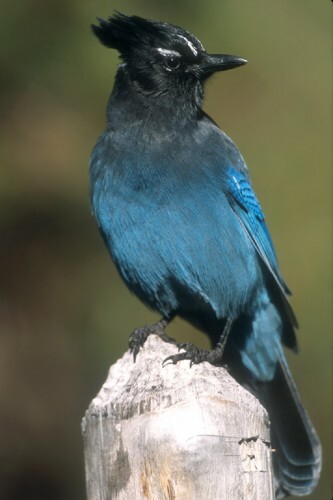 Steller’s Jays sometimes carry several nuts at a time in their mouth and throat, then bury them one by one as a winter food store. Studies have shown that these intelligent birds can relocate their cached food items during lean food months. Steller’s Jay. Image by David Powell. But, when natural foods are scarce, such as during a drough, like the one that has occurred in New Mexico mountains this past year, they sometimes move, to lower elevations in search of sustenance. An occasional movement of a species beyond its normal range in response to weather, or food supplies is called an irruption. 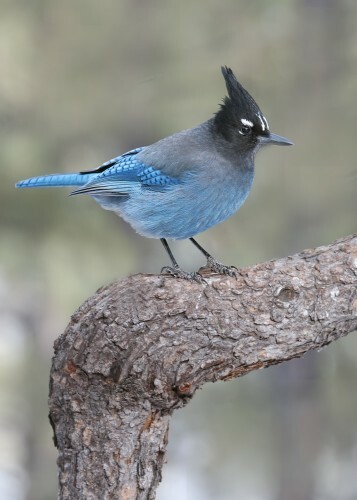 As I write this, we are receiving nearly daily reports of Steller’s Jays showing up in the Middle Rio Grande Valley, and in backyards throughout Albuquerque, considerably lower than their normal coniferous forest range. Steller’s Jay. Image by Doug Brown. These fascinating birds are hardy survivors! Learn more about them on the Cornell All About Birds website, including their calls. Hi, it’s November 19, 2017. There were 6 Steller’s Jays eating half the seed in my bird feeder this morning; I live south of Rio Bravo in the South Valley. Are they suffering drought relted food shortages in the Mountains- they are not afraid of my road runners- hope they don’t keep my finches away from the food- I will have to do another feeder somewhere eelse; they are beautiful! It’s Deceember, 2017, and I’m also seeing a lot of them along the acequias in the North Valley, and was wondering why. Beautiful birds!